Highlights Renovations To Be Made Along Germantown Ave.
Mayor Michael A. Nutter visited three redevelopment projects along Germantown Avenue to highlight smart investments being made in neighborhoods across Philadelphia. The projects are funded by the Department of Commerce and the Office of Housing and Community Development. City Councilwoman Cindy Bass and Deputy Mayor for Economic Development Alan Greenberger joined Mayor Nutter as he toured the dilapidated buildings, which will soon become apartments and space for new and existing small community businesses through redevelopment work by Mt. Airy USA. 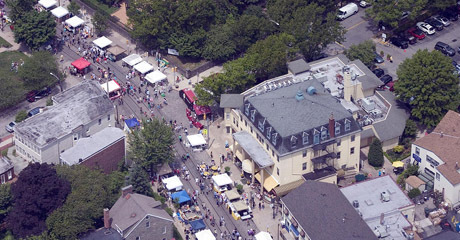 These renovations are made possible by more than $600,000 in mixed use and neighborhood economic development grants from the Nutter Administration. The Department of Commerce and Office of Housing and Community Development awarded Mt. Airy USA $459,000 in Mixed Use Grants supported by Community Development Block Grant (CDBG) funding in 2011 and 2012. In addition, the Department of Commerce awarded Mt. Airy USA a $150,000 Neighborhood Economic Development Grant (NED), again supported by (CDBG) funding this summer. Also receiving NED funding were the People’s Emergency Center CDC, Community Legal Services, People for People in partnership with Project HOME, and the Nicetown CDC. A Request for Proposals for the next round of Neighborhood Economic Development Grants will be issued later this year. Over the coming weeks and months Mayor Nutter and Deputy Mayor Alan Greenberger will make further announcements regarding new investments in neighborhoods across Philadelphia.